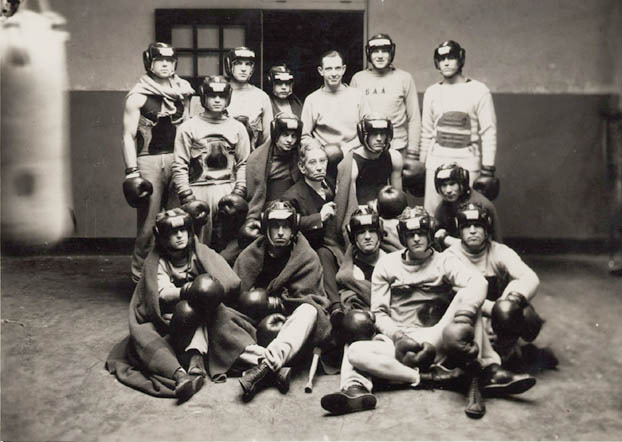 Photograph of Johnny LaRowe with boxing team. No date. Johnny LaRowe is in the center, wearing glasses. Former U.S. Marine and billiard-parlor owner, Johnny LaRowe, became one of Virginia's most beloved and admired coaches of championship boxing teams. Known for his fine character and sportsmanship, he often said that he was "more interested in making men than boxers." Although stricken with a serious illness in 1936, he attended daily practices in his wheelchair until his death in 1940.